I hated to do it, but I’ve just uprooted and thrown away a barrelful of beautiful young strawberry plants. Was I mad? Delusional? No, I was “following directions”—directions of strawberry experts. I used to be a strawberry expert too. My theory was to let them grow “naturally”—wherever they wanted—and pick berries every spring. Usually I ended up with a large, square Berry Patch about 12-feet square, jammed with plants. I picked quarts of beautiful strawberries, but I often wondered why the biggest and best-looking plants grew around the edges, where I also picked the most and largest berries, and why I found the fewest and smallest berries in the middle of the large patch. Two years ago, after my last Berry Patch petered out after six years or so, I tore it out and ordered a new bundle (25) of ‘Allstar’ plants from Indiana Berry & Plant Co. and—get this—read the directions that came with the shipment. Duh … doesn’t everyone do that—read the directions? As the new plants established themselves over spring and summer and put out runners to establish “daughter” plants, I rerouted runners and sometimes used my pruners in an attempt to keep the plants at least 6 inches apart. Last week I tore out the many escapees that had put down roots outside their narrow beds under the protection of summertime squash leaves. I just hated to uproot those beautiful young plants, but, hey, directions are directions, and I want to have a great strawberry crop next year. I’m half way from starting the new Berry Patch in 2012 to picking the first bright-red fruits in spring 2013. I can hardly wait. 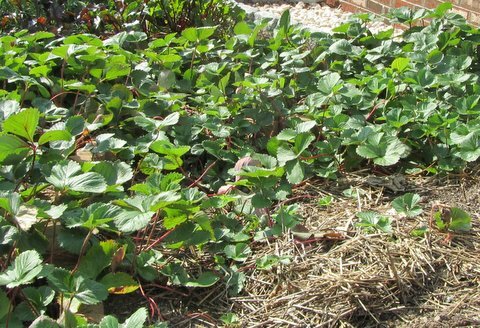 To read my two earlier postings about my new Berry Patch, link to them here: CLICK HERE for “Grow strawberries again?” (April 16). CLICK HERE for “’Thou shalts’ and ‘Thou shalt nots’ of strawberry planting” (April 18). ← Fall veggies: Did I wait too long? Thanks for the reminder to thin my berry patch. Also, did your mulching directions say anything about cutting the leaves back on the plants prior to winter mulching? Info from Indiana Berry says to cut leaves back after harvest ends beginning 2d year, not first, as part of a 3-step annual renovation process. I almost mowed them this year but re-read the directions and am following them. 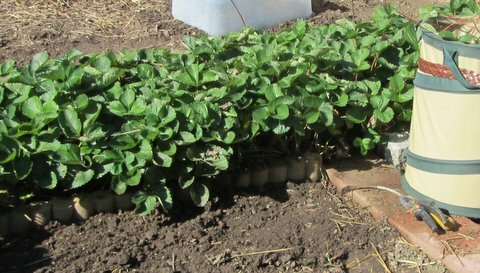 Maintaining a strawberry patch looks like one of the most intensive gardening activities for kitchen gardeners. I hope finally to establish a dedicated patch next spring, and will manage them according to recommendations of the pros. 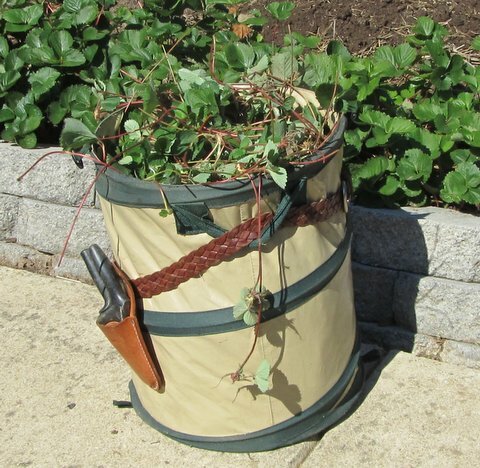 Apparently, one key task is to remove the older plants after runners get established; the older plants produce less and less appealing berries. Good luck with your patch! I don't think Berry Patch maintenance is too demanding–especially when I follow directions and do the upkeep chores on a timely basis. If I had cut off the runners that ran into the squash patch when they first started, the maintenance job would have been minimal. But the two patches are adjacent and work space is limited, so I let the runners “peg” or put down roots. That meant I had to spend more time later uprooting those that were out of bounds. Best wishes as you establish your patch next year!